When I first started this blog, I did a series of posts around the State of African publishing to showcase some of the publishers that were doing their thing - in spite of the challenges that come with publishing on the continent. These included Storymoja in Kenya, Cassava Republic, Farafina and Paressia in Nigeria, Kwela Books and Modjaji Books in South Africa, Mkuki na Nyota in Tanzania and 'amaBooks and Weaverpress in Zimbabwe to name some of the publishers I featured. These publishers continue to produce some amazing works, and I continue to appreciate the awesome work they all do. In the last few years some brilliant works of African literature have been published in the UK and US thanks to small presses; and I wanted to name and pay tribute to them. Presses that are taking risks and publishing a variety of interesting works - SFF, translated fiction, women writers, children's books - and producing work that really excites me. I can't name them all, and I have probably missed out a lot, but here are some who have published books that either fill my library (both physical and virtual), or are about to grace my bookshelf (I might have gone on a book shopping spree in the last week or two). These include And Other Stories who have published works from Ivan Vladislavic and Juan Tomas Avila Laurel. Darf Publishers and their amazing catalogue of North African fiction including translated fiction from Ahmed Fagih, Amir Tag Elsir and Mansour Bushnaf. There's Deep Vellum who also specialise in translated fiction including Fiston Mwanza Mujili and Fouad Laroui. Jacaranda has a special place in my heart as it's publishing some great works from female writers, including Irenosen Okojie; and there's Lantana Publishing who is championing cultural diversity in children's books, with Nnedi Okorafor as one of their authors. 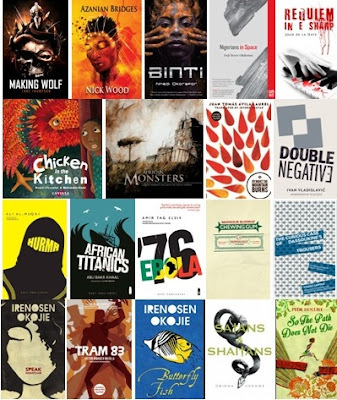 In the world of SFF, special shout out to Apex Publications (Tade Thompson's Rosewater), Fox Spirit Books (African Monsters, Joan De La Haye's Requiem in E Sharp), Rosarium (Tade Thompson's Making Wolf), NewCon Press (Nick Wood's Azanian Bridges), Tor.com (Nnedi Okorafor's Binti) and Unnamed Press (Deji Olukotun's Nigerians in Space). Thank you from a huge fan of literature. The work you do to bring new authors (and established ones) to a wider audience - as well as works from others I would not otherwise have access to - is truly appreciated.